Russian Foreign Minister Sergei Lavrov has announced that Russia and the US have “no common vision” on the crisis in Ukraine after meeting US Secretary of State John Kerry in London. 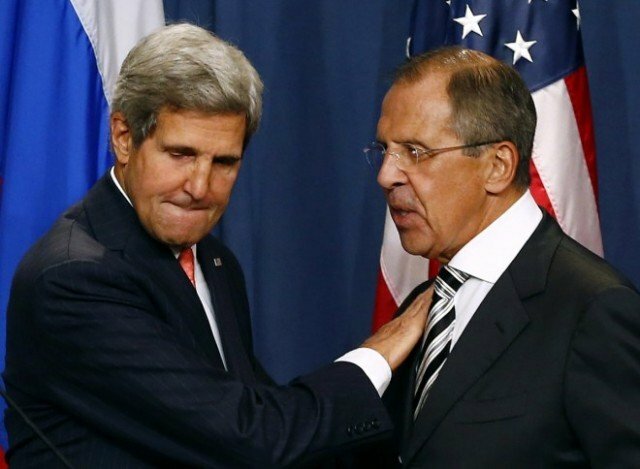 However, Sergei Lavrov called his London meeting with John Kerry “constructive”. John Kerry said the US was “deeply concerned” about Russia sending troops to the Ukraine border and in Crimea. Sergei Lavrov said Moscow would respect the result of Sunday’s referendum in Crimea on whether to join Russia but John Kerry said the US would not recognize it. After six hours of talks, Sergei Lavrov told reporters that Russia had no plans to invade south-eastern Ukraine. Russia would “respect the will of the people of Crimea”, he said. Crimeans are to vote on Sunday, March 16, on whether to leave Ukraine and become part of the Russian Federation. John Kerry, who described the talks as “direct and candid”, said the US acknowledged Russia’s “legitimate interests” in Ukraine. He said that the US had not changed its position on the “illegitimate” referendum in Crimea and would not recognize its outcome. However, John Kerry said his Russian counterpart had made it clear that President Vladimir Putin was not prepared to make any decision until after the vote. The secretary of state said that he had told Sergei Lavrov that there would be consequences if Russia “does not find a way to change course”. Russia’s military intervention in the Crimean peninsula – part of Russia until 1954 and host to its Black Sea fleet – followed the fall of Ukraine’s pro-Moscow President Viktor Yanukovych on February 22. Moscow has not recognized the interim government that took over in Kiev following Viktor Yanukovych’s departure. Sergei Lavrov said that Russia had “deep concern” that there were “no measures” to provide security and order in Ukraine or to prevent the actions of “radicals”. Thursday night saw clashes in Ukraine’s eastern city of Donetsk between a pro-Russian crowd and supporters of the new Kiev government, which left at least one person dead. The US and the EU have said that Sunday’s vote in Crimea violates international law and the Ukrainian constitution, and are planning to impose sanctions against Russian officials if the crisis does not ease. President Barack Obama also reiterated on Friday that there would be “consequences” if Ukraine’s “sovereignty continues to be violated”.